1) God & Satan are both within us. Satan isn't some physical being that dangles an evil carrot in front of us from a stick. It is we ourselves that make the mistakes we make. We have no one but ourselves to blame, not God or "the devil". 2) "If you're using half your concentration to look normal, then you're only half paying attention to whatever else you do. Just pointing out something that could save your life." 3) "You want society to accept you, but you can't even accept yourself." Learn to accept & forgive yourself when needed. 4) Take risks & chances. Sometimes that's the only way you grow as a person. 6) Never try to fit in just to be part of a group. Celebrate whatever makes you different, whatever makes you, you. 7) Don't jump to conclusions about people. Give others a chance. 8) Never consider yourself "THE BEST." No matter what we have achieved, there's always room for improvement, always things we can learn from others. 9) Revenge is never the answer. It will only take you down to their level. Or lower. "As you sow, so shall you reap"- That person will get what they deserve in due time. 10) Don't try to control whatever you are. It may just backfire on you & turn worse. Learn to accept yourself as you are. 11) Don't be afraid to use your talents. Don't think about what others will think or say about you. People will always talk no matter what you do. 12) Welcome hardships & pain, though it may be very hard to do. That saying is true- "What doesn't kill you make you stronger." 13) Don't be naive & trust people too easily. 14) Don't blame others for your mistakes. Learn to take responsibility. 15) Don't just keep obsessing about your negative qualities. Realize that you also have good in you & work towards making your negatives into positives. Good ones Neil. these are some of my favorite quotes. Tysm Maurice! And yeah, they are certainly my faves too! 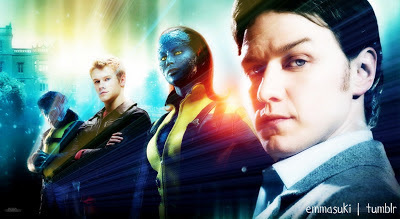 ^_^ The whole dialogue where Mystique is in Magneto's room is the shizz as well!